Joel's Jottings: Will Missile Makers Make Peace? Just six days after India test-fired a long range missile, Pakistan test-fired a medium-range missile, both capable of carrying nuclear warheads. 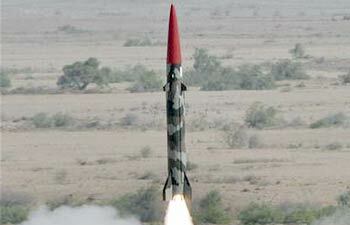 Pakistan’s military and defence personnel say that Pakistan did not conduct this test in response to India’s. Maybe, they are right. It is, perhaps, just a coincidence that the two tests happened within the same week. But, what does it mean to the world and to Asia in particular? With nuclear powers China, Pakistan and India, not known to be very amicable with one another, is this neighbourhood getting any friendlier with this arms race? If Agni-5, India’s long range missile, is capable of travelling distances of over 5000 kms(3100 miles) reaching as far as Beijing and Shanghai, Shaheen 1A, Pakistan’s medium range missile is capable of travelling estimated distances of 2,500 to 3,000km(1,550 to 1,850 miles) easily reaching many major Indian cities. And soon after these tests, we hear the usual rhetoric and political correctness in the statements of all concerned. They all say the same. They are just preparing for deterrence. These weapons are all just ‘just-in-case weapons’ meant to be used only when attacked. All countries assure us of ‘no-first-use’ policy. But, if we look at just the last half-century or more, we do not see very peaceful and responsible behaviour in the region. Three Indo-Pak wars, and one un-declared war, occurred since 1947. Kashmir was not the main issue in all, but this issue is still unresolved. One Indo-China war occurred in 1962; a war for which India had paid dearly. But the issue of Tibet is still a bone of contention between India and China, along with other factors. Obviously, China’s capability, especially nuclear, is several times higher than what it was in 1962. And Indo-China relations do not seem promising. India and Pakistan have both become nuclear capable, and have emerged stronger, with greater weapons of mass destruction, than what they had during earlier wars. And Indo-Pak peace talks keep getting stalled for a variety of reasons. Even treaties made do not last. In 1954, India and China signed a treaty, ‘Five Principles of Peaceful Coexistence’, known in India as ‘The Panchsheel’. But did they not got to war in 1962? India and Pakistan signed the ‘Tashkent Declaration’ in 1966. But did it stop them from going to war again in 1971? And can we have faith in our political systems that peace-dialogues between countries will make the situation to improve? How much focus are these individual countries putting on the acceptance of talks and negotiations, as opposed to their focus on deterrence efforts, of building missiles and warheads? How much enthusiasm do we see among the governments and opposition parties to sit, make, and approve, peace efforts with neighbours, as opposed to the enthusiasm we see with which positive steps by ruling parties are criticized, as signs of weaknesses, by the opposition? These are questions that may not have immediate, practical answers. But these are questions that need deliberation. They must be discussed within the same halls of those hallowed parliaments where those seated have just applauded the making of these new missiles.